Welcome! 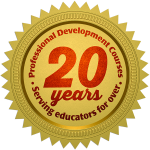 Professional Development Courses is pleased to offer a unique opportunity to hear directly from some of the most well- known authors of educational books in the United States! Every few weeks a new author will be featured. Meet the writers of the textbooks used in our most in demand courses! Authors of our most popular textbooks have written brief descriptions about the contents of their books and why they are relevant and applicable to today's 21st-century teacher. Find out directly from the author why these textbooks and accompanying courses will have a positive influence on your teaching and in your classroom. We hope this intimate connection will aid you in your journey to finding courses that will help you reach your professional goals. Author: Dr. Shirley Cohen, Ph.D.
My name is Dr. David Dupper, and my book is used in a course offered at Professional Development Courses at the University of La Verne. I want to let you know about my book and how it may be useful to teachers who wish to enroll in this course. The reason I wrote this book is because bullying is one of the most prevalent and insidious forms of violence in schools today and the fact that many teachers and other school professionals lack sufficient understanding of the phenomenon of bullying as well as best practices in bullying prevention and intervention. In my book, I expand the current discussion of bullying in schools to include all the ways in which power is misused and abused in schools including adult-student relationships. Rather than a “rite of passage” and “normal part of growing up,” I argue that bullying must be viewed for what it is: a systematic abuse of power that impacts the learning environment of schools in profound ways. I discuss bullying within the larger cultural context of the United States, and I also incorporate international perspectives on bullying. I utilize a whole-school approach as a framework for developing and implementing comprehensive interventions to combat bullying. A whole-school approach seeks to engage all members of the school community (e.g., students, teachers, staff, parents, community members) in developing a common vision and a commitment to combat all forms of bullying in schools. A whole-school approach seeks to change the entire culture and climate of the school. I dispel myths about bullies, and I discuss the increasingly important role that peer witnesses play in combating bullying in schools. A unique feature of my book is the discussion of several “under-the-radar” forms of bullying in schools (i.e., religious bullying, bullying by teachers and other adults in schools). Perhaps most importantly, I discuss specific steps, based on best practices, that can be taken to combat all forms of bullying in schools in as comprehensive a manner as possible. My hope in writing this volume is that it will assist educators, parents, students, and other interested individuals to understand bullying in all its forms and complexity and to plan and implement comprehensive and effective interventions across a number of levels based on this complex understanding. I firmly believe that we have the knowledge and tools necessary to change our schools from a culture of bullying to a culture of compassion. Todd Whitaker wrote the following paragraphs about his and Douglas J. Fiore’s book, Dealing with Difficult Parents, which is used in the course EDUC 712X Understanding and Dealing with Difficult Parents. Do you have parents that you just dread dealing with? When they call on the phone, walk into your classroom, or you see them in the office, do you get a sinking feeling? Do you ever have to deliver bad news to nice parents? This book is designed to provide valuable tools for educators to deal with hostile parents, build relations with all parents, and learn new techniques that can help you effectively deliver tough news in a positive manner. You will develop skills which will allow you and everyone in your organization to be more effective in dealing with these most challenging people. I have been an educator for over 40 years. Prior to the years I spent consulting to school districts and presenting teacher workshops/seminars nationally and internationally on best practices for helping students with ADHD and LD succeed in school, I taught in San Diego Unified School District as a resource specialist. I have authored and co-authored several books and other teacher resources that provide practical strategies and key information for teaching students with learning, attention, and behavioral challenges. I am happy to learn that one of my books, How to Reach and Teach Children and Teens with ADD/ADHD, 3rd edition (published by Jossey-Bass) is used in a course offered at Professional Development Courses from the University of La Verne. Unfortunately, many students with ADHD are struggling in school due to their lack of identification and effective treatment/intervention, as well as the misinterpretation of their behaviors by teachers and others who don’t really understand this brain-based disorder and its impact on their functioning. Of all the books I have authored, this one is my favorite. It has my heart because of the numerous contributions from other teachers, parents, and teens/adults who generously shared their personal stories, insights, and strategies with me, and granted me permission to be able to share with you. I am sure that you will find the interviews, case studies, and particularly Section 5.1: A Parent's Story...What Every Teacher, Clinician, and Parent of a Child with ADHD Needs to Hear to be compelling and enlightening. The message I would like you to take away from this book, above everything else, is that it is never too late to help a child or teen, and often the kind of help that can make a huge difference doesn’t take a lot of effort. Sometimes it's even small changes, such as the way we respond to a student ’s behavior, or a few supports and accommodations provided by the teacher that can lead to significant improvements. Those teacher efforts go a long way in building a close home-school relationship, as well. Don’t underestimate the power of your encouragement, guidance, and support. A quote on a plaque my friend saw summed it up nicely: “Teachers affect eternity. One can never tell where their influence ends.” I am truly delighted that my book is being used as one of your textbooks and hope you will find it to be a valuable resource. Thank you! Author: Dr. David A. Sousa, Ed.D.